Cool, dry; sweet, astringent, slightly bitter taste. 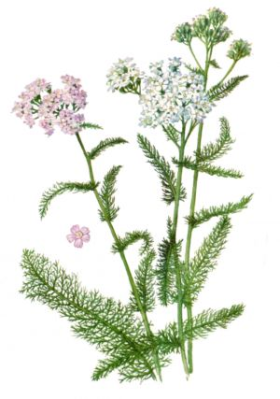 Yarrow is a short to medium (0.2 – 1 metre or 0.66 – 3.3 feet), hairy, perennial plant with creeping rhizome and erect, furrowed, woolly stems; and has a spreading rhizomatous growth form. 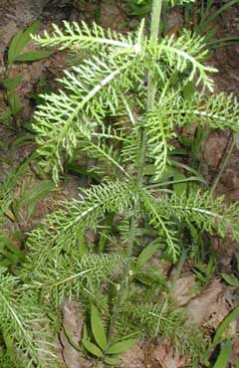 Leaves are 5 – 20 cm long, pinnate, dark green, and finely divided, the segments being partly divided pinnately, hence a feathery appearance. 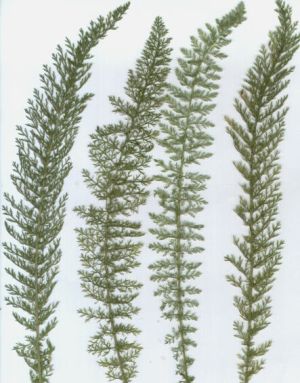 Leaves are evenly distributed along the stem, with the leaves near the middle and bottom of the stem being the largest. Each flower consists of about 20 tubular disc flowers and about 5 ray flowers with short, off-white or pinkish rays. Astringent – causes constriction of mucous membranes and exposed tissues. Infusion - Drink for upper respiratory catarrh or use externally as a wash for eczema. Inhalation - For hay fever and mild asthma, use fresh in boiling water. Fresh - To stop a nosebleed, insert a leaf into the nostril. 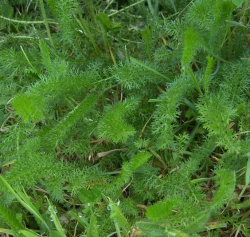 Poultice - Bind washed, fresh leaves) to cuts and grazes. Infusion - Use to reduce fevers and 'as a digestive tonic. Tincture - Use for urinary disorders or menstrual problems. Prescribed for cardiovascular complaints. 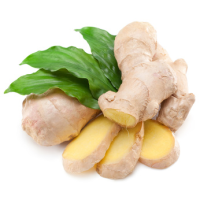 Compress - Soak a pad in the infusion or dilute tincture to soothe varicose veins. 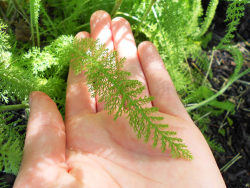 Massage oil - For inflamed joints, dilute 5-10 drops yarrow oil in 25 ml infused St. John's wort oil. Chest rub - For chesty colds and influenza, combine with eucalyptus, peppermint, hyssop or thyme oils, diluting a total of 20 drops oil in 25 ml almond or sunflower oil. Known allergy. 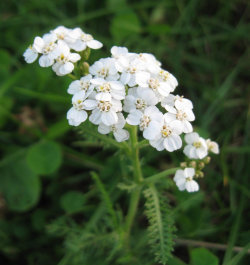 People with known allergy or sensitivity to yarrow should avoid using this plant. 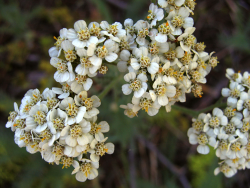 Yarrow may cause inflammation if the wound is subsequently exposed to sunlight. 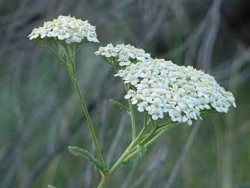 There are no known intersections of yarrow with other plant chemicals. No side effects are expected if taken within the recommended dose range.